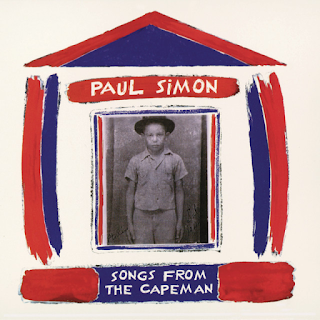 This was a "concept album" from Paul Simon, based on the songs from the musical he wrote, based on the story of Salvador Agron, a Puerto Rican gang member who murdered two teenagers in 1959 in New York City. It has a late fifties, New York "doo-wop" sound to a lot of the music, but, of course, is enhanced by Simon's unique vocals. It is actually pretty good. Critically, it didn't get much praise, which I feel is unfair. There is not much on here that points to it being a bad record. Not at all. Sandwiched in between the South African "Graceland" and the Brazilian "The Rhythm Of The Saints", this is, essentially, Simon's Puerto Rican/doo wop album. Viewed in that way, it is a good record. I think the whole "concept" thing put some people off. I get that, but it doesn't overwhelm the music at all. "Adonis Hermanos" is sung a capella, with some impressive vocal harmonies from both Simon and his backing singers. "Born In Puerto Rico" sees the musicians come in. It is a great, atmospheric track and sounds like it should be on "The Rhythm Of The Saints". Its lyrics speak of life in the barrios - "red beans and rice from kitchen windows....we came here wearing summer clothes in winter....". The evocative lyrics are many on this excellent song, plus there is some great Latin trumpet in the middle too. Salsa rhythms are used too, most effectively. "Satin Summer Nights" uses a lot of doo-wop but also some Latin guitar too and has a great atmosphere. "Bernadette" is possibly the best-known track, being included on the "Shining Like A National Guitar" compilation. Again, it is full of rock 'n' roll idioms, vocals, instrumentations and an effervescent, lively melody. "The Vampires" has some delicious Latin brass sounds and a slow, syncopated salsa piano rhythm. Simon doesn't hold back on the profanities in the spoken "gang" background vocals. It all adds to the convincing atmosphere though. "Quality" returns to the lively doo-wop beat, it is fun of late fifties sounds, complete with a slowed-down "bridge" part. "Can I Forgive Him" is a slow voice and acoustic guitar narrative. "Sunday Afternoon" is also a laid-back number featuring a female lead vocal, while Simon returns for the rhythmic mid-paced bluesy rock of "Killer Goes To College". "Time Is An Ocean" features many of the assorted vocalists, male and female, on a shuffling tale of Agron's rehabilitation in prison. It has some great lyrics. "Virgil" has a thumping beat and a rock guitar riff intro and is sung from the point of view of the prison guard who guarded Agron and resents his academic progression. "Killer Want To Go To College II" is very much a typical Paul Simon-sounding song. The album ends with "Trailways Bus" which is another that sounds very much like the songs on "The Rhythm Of The Saints". Again, it is a most atmospheric song. It seems to tell the tale of Agron, free from incarceration, and travelling on a bus. It can almost be taken as a separate song from the rest of the album, though. Overall, this album is an enjoyable listen, although the first half of the album is probably the better.